A question I am often confronted with in our laboratory, which focuses on basic retinal research in the Department of Biology, Animal Physiology (Head: Prof. Dr. Johann Helmut Brandstätter) at the University of Erlangen-Nuremberg, Germany. 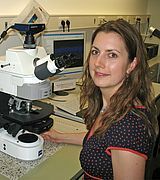 My name is Johanna Mühlhans, I am a second year PhD student, and my thesis – supervised by Dr. Andreas Gießl – combines two different projects, which are about cell types, synapses, photoreceptors and ciliary structures. Pericentrin (Pcnt), a conserved protein of the pericentriolar material (Pcm), plays an important role in microtubule organization and serves as a multifunctional scaffold for numerous proteins and protein complexes. Pcnt interacts with various proteins and, in this way, contributes to a diversity of fundamental cellular processes. Recent studies indicate that Pcnt mutations are associated with a range of diseases, e.g. Majewski/microcephalic osteodysplastic primordial dwarfism type II (MOPDII) and Seckel syndrome, two rare human autosomal recessive genetic disorders. Moreover, further studies suggest a role for Pcnt in human cancer, mental disorders and ciliopathies. Until today two Pcnt splice variants from orthologous genes in mice and humans – Pcnt 250 (mouse) and 360 (human 380) – are known, and a possible third one is predicted. 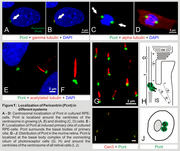 Pcnt localizes also to the base of primary and motile cilia and is involved in cilia development and function in mammalian cells (Figure 1). In the vertebrate retina, photoreceptor cells are morphologically and functionally arranged in several compartments. The light sensitive photoreceptor outer segment is linked with the inner segment, which contains the typical energy producing and protein synthesizing components of an eukaryotic cell, by a modified, non-motile cilium, termed the connecting cilium. 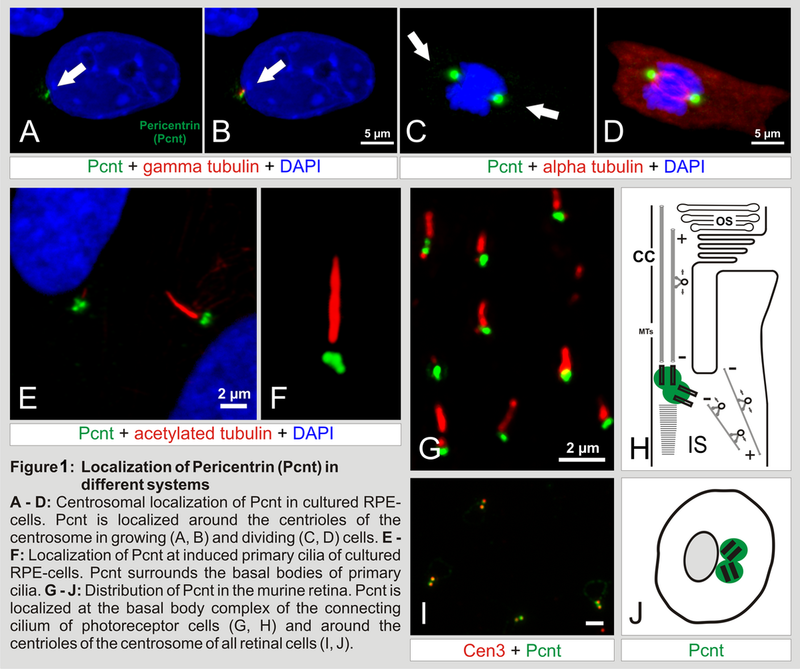 We were able to show that Pcnt and several centrosomal interaction partners are not only localized at primary cilia of a variety of cell types, but also at the basal body complex of the connecting cilium of photoreceptor cells (Figure 1). In my project I analyze with a wide variety of methods - e.g. high resolution light and electron microscopy combined with immunocytochemistry, laser-microdissection, quantitative PCR, in situ hybridization and western blotting - the different splice variants of Pcnt in the retina in vitro and in vivo. 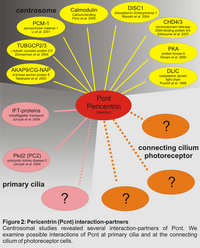 I am interested in the distribution and function of the Pcnt splice variants and their interaction partners at primary cilia and in photoreceptor cells (Figure 2) – information, which may help to better understand the processes of intracellular trafficking between the inner and the outer segment. We think that studying Pcnt function will provide novel insights into human ciliary disorders. Complexin (Cplx) 1, 2, 3 and 4 are a family of small, soluble proteins that bind to the assembled exocytotic core complex, and are involved in the regulated release of neurotransmitter at chemical synapses in the central nervous system. In the mouse genome the four proteins are encoded by different genes: Cplx 1 and 2 are - like Cplx 3 and 4 - highly homologous to each other, whereas Cplx 1 and 2 show only a very limited homology to Cplx 3 and 4. In contrast to Cplx 1 and 2, Cplx 3 and 4 contain a CAAX box motif, which leads to farnesylation. It has been shown that this farnesylation motif causes membrane targeting of Cplx 3 and 4. Whereas Cplxs 1, 2 and 3 are distributed in the retina and brain, Cplx 4 is restricted to the retina. 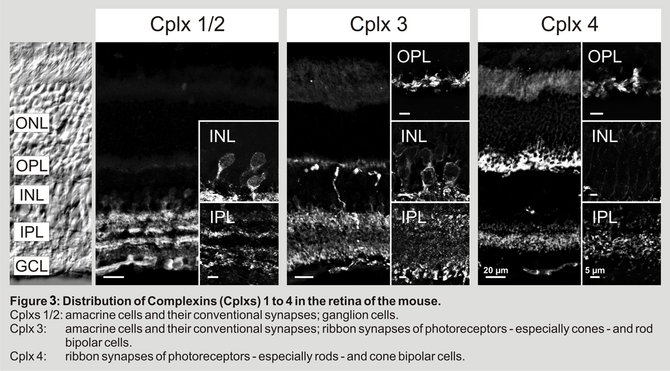 With immunocytochemistry and high resolution light microscopy, I examine the cellular, synaptic and developmental expression of all four Cplx isoforms in the mouse retina. Using a variety of different cell and synapse markers in combination with light and electron microscopy I am able to show the exact localization of the four Cplxs in the retina (Figure 3). The differential expression of the Cplxs points to a functional segregation of the various synapse types in the retina – ribbon and conventional. Differences in the organization of the presynaptic molecular machinery are responsible for the different modes of neurotransmitter release found in retinal conventional and ribbon synapses, the molecular basis for retinal signal processing and proper retinal function. To understand the enormous complexity of synaptic function is one of the challenges of basic retinal research, the results of which are, however, of fundamental importance for a translational approach in retinal research. I am pleased with the progress my projects make, and on this note, I want to thank the Pro Retina Foundation for rewarding my work with one of the poster prices at the Pro Retina Potsdam-Meeting 2010. Not only that this award made me very proud and happy but it is also a significant motivational boost. Two years ago in 2008 the Pro Retina Meeting in Potsdam was the very first scientific meeting I visited – at that time as a diploma student – and without any own data. Today, two years later, I have started to work on the first publications. My current strategy is not to look too far ahead, but rather focus on the questions, challenges and problems on a short term basis. With this I am able to reach realistic goals, stay motivated and, last but not least, go step by step in every possible direction the newest results may lead. My next goal is to finish and submit two publications from my work and, hopefully, some more in the two remaining years of my PhD thesis. Mühlhans J et al. (2010) Pericentrin, a centrosomal protein, identified at the basal-body complex in mammalian photoreceptor cells. Mühlhans J et al. (2010) Exact cellular and synaptic distribution of Complexins in the mouse retina. Mühlhans J, Reim K, Gießl A, Brandstätter JH (2009) Cellular and sub-cellular distribution of Complexins in the mouse retina. European Retina Meeting 2009, Oldenburg. Mühlhans J, Brandstätter JH, Gießl A (2010) Different Pericentrin-isoforms identified in mammalian photoreceptor cells. Pro Retina Research-Colloquium, Retinal Degeneration: 10 years into the new century, where do we go from here?, Potsdam.